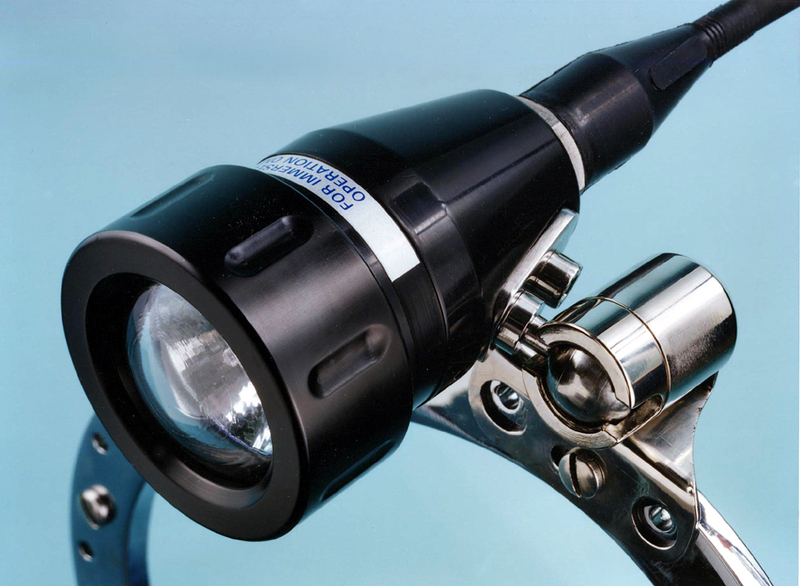 The Aquabeam DHL-4 is a tough, compact and cost effective helmet light ideal for the inshore diver. Operating with 12 volt reflector lamps with power outputs of 12, 20 or 35 watts the DHL-4 is rated to a maximum depth of 300 metres. By using either the 'stay-put' friction bracket or the universal mount bracket, the DHL-4 will interface with most modern helmet faceplates including the Kirby Morgan range of helmets and masks. The DHL-4 is supplied without lamp, with fixed universal mounting bracket and with either 2 or 4 pin connector. Black acrylic; aluminium HE30 (hard anodised); borosilicate glass; stainless steel 316; synthetic rubber (neoprene); ceramic. Note: DHL-3P bezel is manufactured from acrylic and that of DHL-4 from aluminium. Penetrator with short cable, terminating in ARMG-2-MP or ARMG-4-MP, with high impact, polystyrene locking sleeve (alternative connectors and or longer cable, fitted to order).